Jeb Dunnuck, founder of the highly followed blog "The Rhone Report," has joined the team of the Wine Advocate. The magazine is worldwide known. Created by the renowned Robert Parker, Now Jeb Dunnuck covering the part of the magazine devoted to the Rhone Valley. At the end of August, Jeb Dunnuck was at the federation of Chateauneuf-du-Pape to taste the vintages 2012 and 2013 with no less than 550 samples, few days in our vineyards have not been easy. 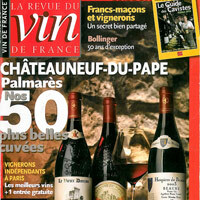 It also provides a retrospective of Châteauneuf-du-Pape in October, on the vintage 2005.